The Glendronach 18 year old has been finished in Tawny port casks, and is bottled at natural colour with no chill-filtration. This expression was initially matured in European oak casks, before being finished in the aforementioned port casks, imparting some incredibly rich, fruity and dark sherry and port notes. Nose: Funky strawberries and raspberries. Slight blackcurrant syrup. Sweet barley, dried cherries and cranberries. Almonds. Plummy oak. Palate: Peppery oak, dried fruits. Vanilla, almonds, blackcurrant. Sweet barley, dried cranberries, freeze dried strawberries and raspberries. Some slight plums and nice barrel funk. Slight sweet vermouth. Finish: Long, warm, finish. A lot of dried fruits and rich sweet wine. Overall: A really nice port finished whisky, plenty of fruit and spice. 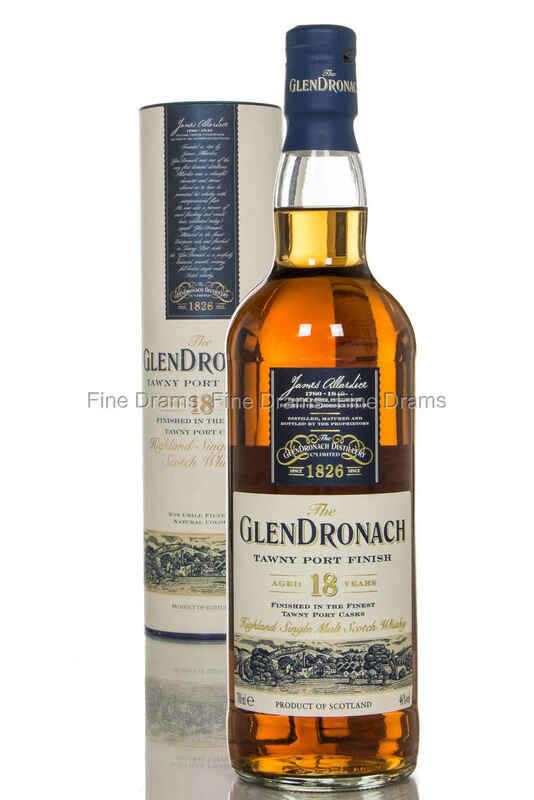 Berries take the fore, but the typical Glendronach funk makes up the background. A must try for fans of Glendronach and ported whisky!